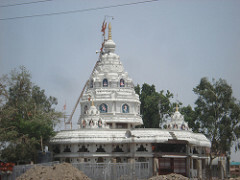 Bhadra Maruti Temple, dedicated to Hanuman is located at Khuldabad near Aurangabad. The idol of the lord is in a reclining or sleeping posture. There are a total of only 3 places where one can find the lord in this unique position. The second noted place is a temple on the banks of Yamuna at Allahabad, Uttar Pradesh and the third is at Jam Sawali Madhya Pradesh. Devotees flock to the temple during Hanuman Jayanti, Ram Navami and on all the Saturdays of the month of Shraavan.